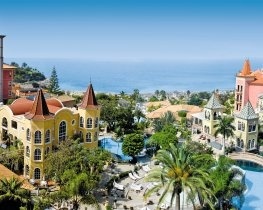 Classic Collection Holidays features an outstanding selection of 4 & 5 Star hotels in Costa Adeje. With so much to offer, Costa Adeje’s beaches, shopping opportunities and activities both on and off the water attract couples and families alike. With all inclusive family friendly hotels and adult only romantic retreats available, there is luxury accommodation to suit all who visit. Why not try the wonderfully popular and exquisitely constructed Bahia del Duque. 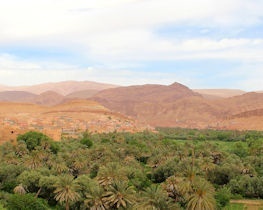 With something for everyone this hotel offers the ideal holiday location for couples and families alike. Immerse yourself in the tropical gardens and glorious beach, delight in culinary masterpieces created in the hotels’ restaurants and make use of the diverse array of high quality facilities on offer. Treat yourself at the charming family owned Jardines de Nivaria. Feel at home in the tranquil guestrooms, lounge under the shade of palm trees around the pool and pamper yourself in the Aequor Spa. With easy access to the beachfront promenade, you can wander along and explore the designer shops, restaurants and cafes. For a serene adult only escape, which is committed to green practices, choose the Iberostar Grand El Mirador. Elegantly designed, the hotel’s charming layout makes the most of the exquisite ocean views and boasts a plethora of gourmet dining options. With a first-class fitness centre and premium spa facilities, guests are free to train and pamper themselves throughout their visit. 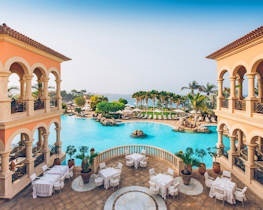 The Iberostar Grand El Mirador enjoys a wonderful location in an elevated position opposite the glorious sands of the Playa del Duque Beach offering unbeatable views of the Atlantic ocean. 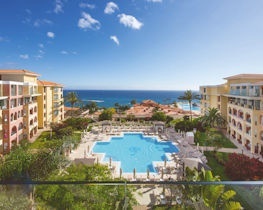 Set in lush sub-tropical gardens Bahia del Duque is located in Adeje on the southern coast of Tenerife and enjoys direct access to the oceanfront and beach. With Playa del Duque and Playa de Fanabe beaches within a five minute walk either side, the recently opened GF Victoria is a luxuriously modern resort hotel focusing on health and wellness for all ages and which prides itself on its minimal environmental impact. In a prime location between the beaches of Playa del Duque and Playa de Fanabe on Costa Adeje, the all suite, adult only Iberostar Grand Salome offers the highest level of comfort, personal service and a range of excellent facilities. 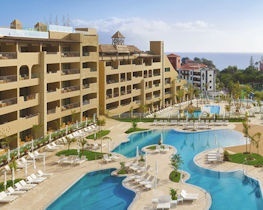 First impressions of the attractively designed Iberostar Selection Anthelia in Costa Adeje is one of spaciousness, with extensive communal areas, large swimming pool areas and delightful, well groomed gardens.